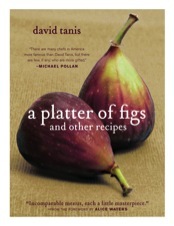 A Platter of Figs and Other Recipes – That's Natural! Sublime. A recipe with two ingredients; garden, sun ripened, heirloom tomatoes and sea salt, it’s utterly flawless. The collection of menus in A Platter of Figs and Other Recipes communicates the simplicity of well deserved food. David Tanis is a culinary artist who lives for the ingredients that are combined to be placed before a table of companions. I approached this cookbook with some trepidation when I discovered that David Tanis is a Chez Panisse chef. The Chez Panisse Cookbook that my mother gave to me years ago still gathers dust on the upper shelf in my kitchen, and never has its beautiful pages inspired even one meal. That cookbook has always been on the periphery of my cooking skills, and the ingredients are nothing I can find in a Pueblo farmers’ market. But figs are one of my new favorite foods and this cover was irresistible. It turns out that David Tanis came up with a sweet arrangement with Alice Waters to work six months of the year in Berkeley and live the other six months in Paris. And while in Paris he and his partner run a dinner salon in their apartment. At the introduction to each menu we are treated to a story of food; the discovery of ingredients, the gathering of food, the making of recipes, or the imbibing with friends. Many of these stories come from his time spent in Europe. To my relief the recipes are attainable for mere mortals. Tanis’ style evolves from the simplicity of the ingredients. No, I can’t find the exact ingredients that Tanis uncovers in the Parisian markets but his recipes encourage me to find my own alternatives. I’ll be at the Loco for Local market picking out the purple eggplants to go along with my gardens’, sun ripened, heirloom tomatoes and I’ll be inspired to make my own menu with clues from Tanis. Oh, I find I’ve neglected to gush over the photos—sublime! and avid traveler, bookworm, gardener, and cook.